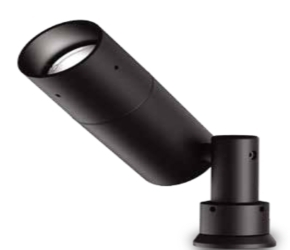 Cambria 703 is an ultra-compact fixture for use with MR16 ceramic metal halide lamps. It is available with a fully adjustable side swivel stem (703, 703-FL), an adjustable center rear swivel (703-CRS) or stationary rear flush mount (703-FM). Various lenses, louvers and color or dichroic filters can be combined - up to three at once - to create multiple lighting effects.